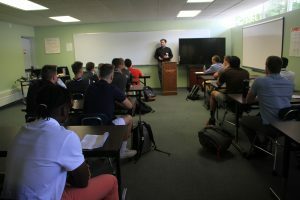 The Bridgton Academy computer network is designed to complement and expand the academic program. All members of the Academy community have access to the network. Bridgton Academy is a 1:1 iPad school. All students as part of their enrollment agreement will receive an iPad 6 during orientation for use while on campus. Each student will receive one iPad 6 and charger. We encourage all students to acquire their own case and keyboard. The devices will be required for all classes. If a student arrives to campus with an iPad, the device must adhere to the policies and procedures dictated by the technology department, including the Acceptable Use Policy and policies set forth during the orientation process. Upon graduation, the iPad is for students to keep but while they are on campus, certain school related apps and functions are required to be installed on the iPad itself. Personal devices will also have to adhere to the rules and regulations of the school or the iPad will not be allowed on the BA network. More iPad policies and procedures will be discussed further at orientation. All students will be required to have a personal, United States-based iTunes account upon the start of Orientation. Please be advised that these accounts are connected to a personal email and should have a credit card associated with them for optimal functionality. There should never be a school-initiated reason for the students to use the credit card, but sometimes the functionality of the iTunes store is limited when there is no credit card account attached. All account activity would be initiated by the student so if there is any unwanted charges – the student would be the first person to contact. Use of a device at Bridgton Academy is essential for academic success. Students are required to have all papers typed. In addition, much of the research needed for major essays and research papers is done on databases accessed through the network and on the Internet. Various classes use different forms of online storage for assignment functionality. Printing is currently available in designated areas of campus for the iPads, so no personal printers are needed for use. Instructions on how to print will be given at Orientation. • Each student has an e-mail account through the Google Education Platform. Addresses will be available during Orientation. Students are strongly encouraged to check their school account daily. All school, college and athletic correspondence is directed to that account including outside sources for athletic recruitment. • In addition, all faculty and administration can be reached through their e-mail addresses – visit our Contact Us page for more information.